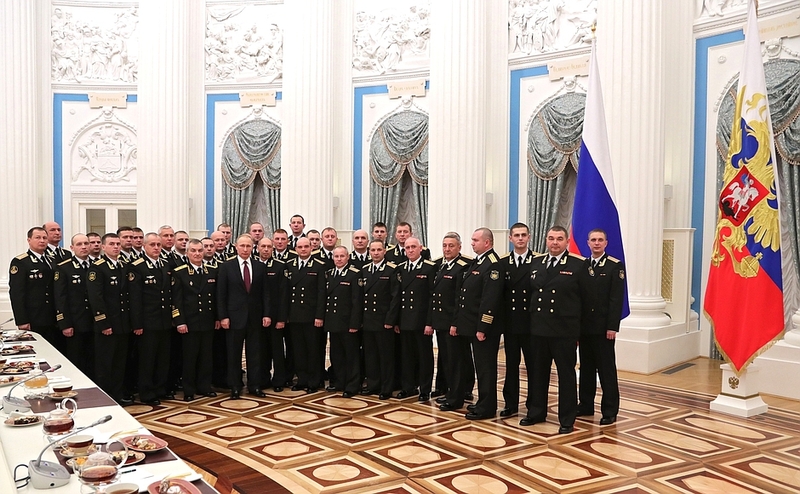 Vladimir Putin met with Northern Fleet officers who distinguished themselves in service and combat missions in the Mediterranean, off the coast of the Syrian Arab Republic. First of all, today, February 23, I would like to congratulate you on the Defender of the Fatherland Day. I want to wish you all the best you and thank you for your military service. You have opened another page in the history of the Russian Navy. And not just by embarking on such a long and successful campaign, a complex mission under conditions, let us be frank, in which we faced resistance to our efforts in fighting international terrorism, rather than assistance from our so-called partners. In these conditions, you accomplished this mission capably, with good quality. Much has been done for the first time. This includes the use of modern equipment, and I do not just mean the naval version of the MiG-29, but also the use of high-precision weapons. You have accomplished all the tasks set before you, and inflicted considerable, significant damage on international terrorist groups, their bases, weapons depots, ordnance caches, equipment and infrastructure. And this undoubtedly contributed to the positive results of the efforts of all countries involved in combating international terrorism, in this case in the Syrian Arab Republic, and facilitated creating conditions for the continuation of peace talks between Syria’s government and the armed opposition. This is important. But for us it is no less important, perhaps even more important, that, unfortunately, in Syria, a huge number of militants have amassed, who have come from the republics of the former Soviet Union and from Russia itself. Our preliminary data show their number to be in the thousands. According to our General Staff, and to our special services, for example, the Federal Security Service, there are up to four thousand militants from Russia and about five thousand from former Soviet republics. Considering that we have a visa-free travel regime with practically all former Soviet countries, we are aware of the enormous danger for us, for Russia, lurking in this terrorist breeding ground in Syria. And by accomplishing combat missions away from our home borders, you have directly contributed to ensuring the security of the Russian Federation. For this, I would like to heartily thank you once again. 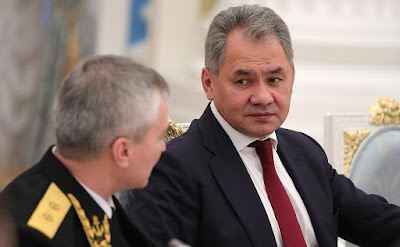 I sincerely hope that the experience you have gained in the combat operations will be carefully examined and will be applied by you and by new generations of Russian sailors to come after you. Let me again wish you a happy holiday, and all the best. Thank you very much. Commander of the Admiral Kuznetsov aircraft-carrying heavy cruiser, Captain 1st Class Artamonov. On February 9, we completed our long-distance campaign. The cruiser is now moored in the Hero City of Murmansk. The combat mission was fulfilled, and all crew members are back, healthy and ready for future missions. Allow me, on behalf of our large crew, to thank you for praising our efforts. This combat mission has every right to take a special place in the history of the Russian Navy, and maybe even in the history of the Russian Armed Forces, since it was during this campaign that new MiG-29 aircraft were used in combat to conduct strikes against ground targets. During this campaign, the state-of-the-art Ka-52 shipborne helicopter was tested. It delivered on expectations, especially in terms of ship security and supply missions, and we expect this helicopter to be put into service. Most importantly, during this campaign young pilots, who are the future of marine aviation, carried out operation flights alongside veteran marine pilots who have been working on the aircraft carrier for decades. The cruiser is back and is ready for further missions. Let me assure you that the crew will always be faithful to its military duty and the traditions of the Russian Navy. Aircraft Squadron Commander of the 100th Independent Shipborne Fighter Aviation Regiment, Captain Revyakin. Shipborne aviation personnel of the Russian Navy are cognizant of the confidence vested in us by our Motherland. We hope that we were able to meet the objectives we were set with honour and dignity. I was honored to be among the first to start using MiG-29K aircraft. During the campaign, I performed 17 flights from the aircraft-carrying heavy cruiser. All this was a result of the combined efforts of the manufacturers, test pilots and my companions-in-arms. The MiG-29K is equipped with a cutting-edge navigation target acquisition system, which greatly reduces the burden on the pilot, giving him more time to evaluate the situation and take decisions, which enhances effectiveness in fulfilling the mission. In August 2016, I carried out my first test landing on the aircraft carrier, which could be compared to a pilot’s first flight as far as emotions and feelings are concerned. I am very happy and grateful for the opportunity to experience this feeling for the second time in my life. The state-of-the-art multi-purpose MiG-29K aircraft, as well as the upgraded Su-33 planes, proved their combat effectiveness and relevance during the military campaign in Syria against international terrorism. They are easy to use, reliable and precise in their operation, which is proof of the high level of development of the Russian military industrial complex and the fact that it makes the best military equipment. I am proud to be Russian, to serve in the Russian Armed Forces under St Andrew's flag. 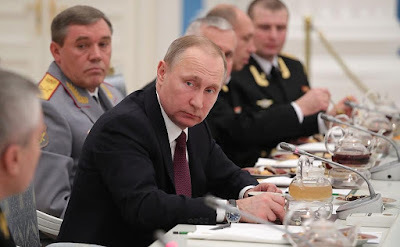 Let me assure you, Comrade Commander-in-Chief, that the shipborne aviation pilots can defend Russia’s national interests and fulfil any mission you give us. Mr. Revyakin, do MiG-29K aircraft equipped with the new target acquisition system actually work better compared to other models? Firstly, not only do they work better, but they also enable the pilot to plan actions in advance using information on the tactical environment. The pilot can now consider different ways of attacking a target. This means that we can work as a group to choose from various options. Comrades, are there any questions? Go ahead, please. Head of the campaign quarters of the naval group, Captain 1st Class Saloshin. In the 117 days of the campaign, the ships covered over 17,000 miles, and had to perform in various conditions, including storms. The equipment was reliable, and the crew did a great job. NATO ships were constantly near us as we crossed the Mediterranean Sea on the way to our destination and back. There were about eight ships near us, and their actions were far from friendly. Any war eventually ends. Different countries have different visions of Syria’s future. It is no secret that some countries see Syria split into several parts. What is the position of the Russian Government on this issue? I have made public statements on this issue on a number of occasions. Primarily, we believe in the need to preserve Syria’s territorial integrity. As you rightly noted, not everyone shares this view. Religious strife is a matter of special concern for me: followers of one confessional group move to one part of the country, while others concentrate in another. This could result in negative consequences for the country. We know Syria as a multi-ethnic, multi-religious and secular state. It has been this way for a very long time, which guaranteed the country’s territorial integrity. This is what we see as our objective. At the end of the day, however, it is up to the Syrian people to decide. We need to do all it takes to ensure that the issue of preserving the country’s territorial integrity is resolved without any outside interference. As you know, our objective is to fight international terrorist groups, and you contributed to furthering this objective. We have every right to view the first successful talks in the capital of Kazakhstan, Astana, between representatives of the armed opposition and the Syrian Government with the participation of Russia, Iran, Turkey and Jordan as a result of these efforts, including your work. I hope that having gained for the first time a solid foundation, this political process will continue as part of the talks now underway in Geneva. The situation there is quite challenging. That said, the sooner the country launches a political settlement, the more chances there will be for the international community and you and me to overcome the terrorist contagion in Syria. This is essential for us. We will not, we should not and are not seeking to interfere in Syria’s domestic affairs. Our only objective is to stabilize the legitimate government and deal a decisive blow against international terrorism. This is the underpinning of our efforts. This is the way we are going to articulate our objectives. Mr. President, we would like to present to you a large photograph and ask you to pose for a group photo. Yes, we will do that now. We will take a group photo, and it will be my pleasure to accept your photograph. Comrade Commander-in-Chief, permission to speak. Senior officer of the naval group campaign, Vice Admiral Sokolov. Comrade Commander-in-Chief, it is only now, after the post-mission analysis at the Northern Fleet headquarters and at the Navy general headquarters, and just now at the meeting with you, that we have come to understand how much we have done and the importance of the naval group campaign. 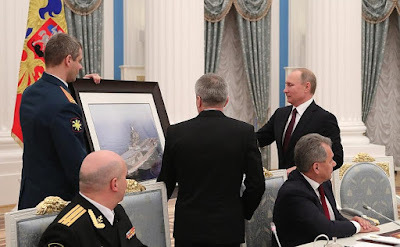 We have opened the eyes of many, including those in our country, to the true sovereign power of our Fatherland, the ability of the Russian Navy's ship-based marine aviation to achieve combat objectives. Certainly, the main task of the naval group was to launch strikes on armed groups of international terrorist organizations on the territory of the Syrian Arab Republic. But the scope of the objectives of the naval group was very large. Suffice it to say that, along with striking ground targets on the territory of Syria, ship-based combat aviation performed aircraft defense flights and fighter counter air support of naval strike and special aviation forces. Present here are helicopter pilots of the ship-based aviation, who have performed more than 750 flights with various objectives along the coast of the Syrian Arab Republic, including search and rescue support of our aircraft's combat flights, aerial survey, antisubmarine and undersea diversionary defense, air transportation and military escorts. While accomplishing these missions off the Syrian coast, the methods and techniques evolved. Many of them were used for the first time, including for receiving cargo on ships and loading air weapons. The volume of liquid cargo alone received by our naval group on the sea was over 50,000 tonnes. In terms of composition, this naval group during this campaign was the most powerful and balanced ever. In the central part of the Mediterranean Sea, it was reinforced by Black Sea Fleet vessels, and carried out tasks with support from units of other types and formations of the Russian Armed Forces, with close interaction with the Russian Aerospace Forces in Syria. The experience gained in this campaign will certainly be considered while training military command bodies and during rapid and combat training exercises and in the training of personnel. Let me assure you, on behalf of the Northern Fleet sailors, that we will accomplish all tasks set before us. Russian sailors will proudly carry the flag of the Russian Navy to every corner of the world ocean. 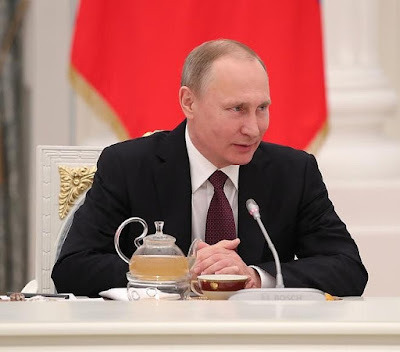 On this occasion, Comrade Commander-in-Chief, allow me, on behalf of all servicemen of the Russian Armed Forces, to congratulate you, as the chief defender of our Fatherland, on Defender of the Fatherland Day, our professional holiday. And please accept this photograph of the Russian aircraft carrier Admiral Kuznetsov in the Mediterranean Sea as a reminder of today and of our successful mission. I would like to say a few words in conclusion. I am especially pleased to see you. It is always nice to meet naval personnel, but I am especially glad to meet you. The reason is, one of my duties is to control the development of the Armed Forces, their future and their present, that goes without saying. The Minister and the Chief of the General Staff know that your mission, and the preparations for it, is my personal initiative. I would like to thank the Defense Minister and the Chief of the General Staff, representatives of the industry who, upon receiving the instruction a year ago, promptly prepared the equipment, the materiel for you, and you, in turn, prepared your subordinates and brilliantly executed the tasks that were set forth. When I was formulating this task to the Minister and the Chief of the General Staff, I proceeded from several considerations. First, the aircraft carrier has been in the Armed Forces since 1991, and has always pursued, it seems, tasks related to training and demonstration. For this reason, the industry was instructed with the task to properly prepare it and to create a corresponding aviation wing. That is how the final version of the MiG-29 appeared. You spoke about the difficulties you encountered as you carried out the combat mission. I thought that those difficulties would arise, and that you would have to overcome them. And you have done all that. The task was difficult and complex. I am glad that you coped with all of its elements, and this is undoubtedly a good step towards the development of the Russian Navy in all its parts. Once again, I would like to wish you a happy holiday, and to thank all the officers and the personnel of the group for the brilliant execution of the task set before you. Vladimir Putin with Northern Fleet service members. 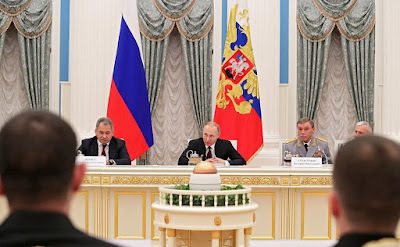 Vladimir Putin at a meeting with Northern Fleet service members. Vladimir Putin. Picture of Admiral Kuznecov. Sergei Shoigu at a meeting with Northern Fleet service members. Northern Fleet service members meeting with President Putin in Kremlin. Vladimir Putin and Sergei Shoigu in Kremlin. 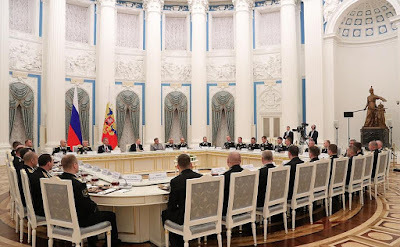 0 Comment to "Putin had a meeting with Northern Fleet service members"